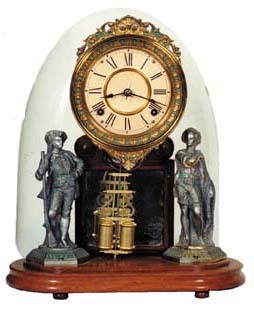 Ansonia Clock Co. "Crystal Palace No. 1 Extra", ca 1880. 8 day, spring movement, strikes a nickel bell on the half hours. The movement is signed Ansonia. Rests on a walnut base, 14 1/2 inches by 7 1/2 inches, total height is 16 1/2 inches without the dome. The statues have lost about all of their original gilt, now a pewter color. Some green in the grooves that matches the sash surrounding the dial. The clock case is very clean, movement is running. Old dome with "cats eyes" and bubbles. Ly-Ansonia No.240-243. Looks identical to this clock.